Ten years ago this July I traveled to Rome, Italy, one of the world’s enduring and enchanting cities. There in that cradle of civilization, the beauty of ruins captivated me. There by the Tiber River, old columns cast shadows across history, across time, across me. To this day I see the Colosseum (Coliseum) in all its gory glory, site of animal slaughters, gladiator deaths, and executions. I remember standing in the Colosseum tying to conjure up the anguished cries of men and animals but hearing only the murmur of crowds and banter of tour guides dressed like gladiators. One poked his sword at me in mock combat, laughing as I jumped back. He caught me by surprise. My mind was elsewhere. In the midst of Rome stand ruins aplenty. If modern man has one habit of ruination it is his thoughtless destruction of the old to make way for the new. Ancient Romans had enough sense to preserve the columns of the Temple of Venus, the Arch of Titus, the Temple of Saturn, and the Roman Forum. Here and there amid the city, ancient aqueducts stand shoulder to shoulder with contemporary architecture, a juxtaposition the old aqueducts dominate. Their ornate walls please the eye like no modern building can. Rome’s ancient ruins add draw to that modern-day enterprise known as tourism. To see Rome is to see her ruins, but Rome has nothing on the South. It thrills me to see remnants and ruins of the Old South still standing. One look at the photograph attending this feature and your eyes will keep going back. 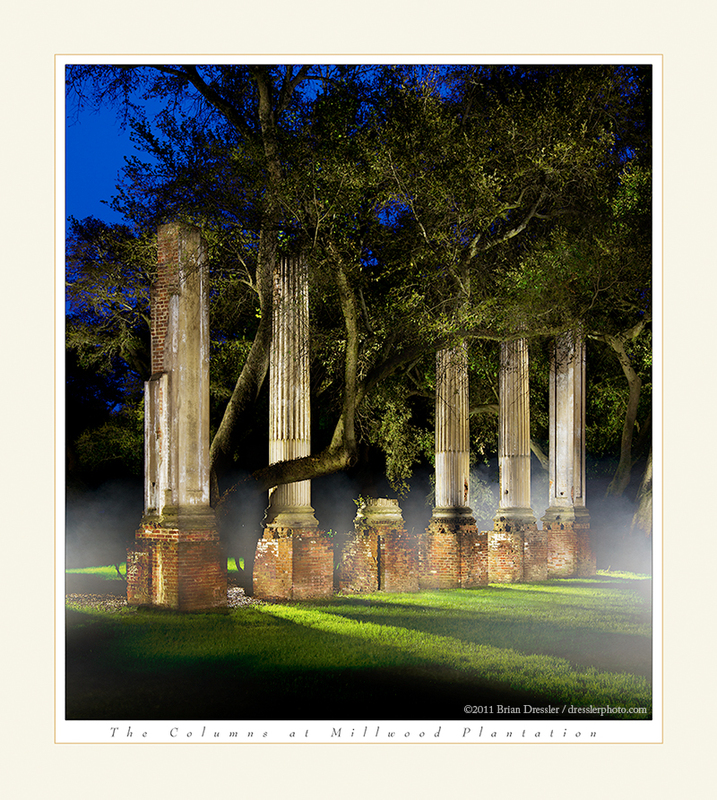 The photograph, artfully taken by my friend, Brian Dressler, reveals the columned ruins of Millwood Plantation here in Columbia, South Carolina. What you are looking at are the remnants of a grand southern plantation that sat on 13,000 acres once upon a time in the antebellum South. A Confederate general by the name of Wade Hampton III owned the plantation. Travel a winding drive amidst old-growth trees, just off a thoroughfare, and suddenly you come upon five large pillars and one pillar’s stubby remnant, all imbued with character from weathering and green moss. Ruins are all that remain, burned by General Sherman’s troops February 17, 1865. No proof exists that Sherman ordered the plantation house’s burning, but he was passing through and Wade Hampton was a Confederate general. Do the math. In 1971, the ruins made the National Register of Historic Places, as well they should. And the ruins make my personal register. My daughters are related to the old general by way of their mother’s family and the name “Hampton” persists to this day in his descendants, several of whom live in Athens, Georgia, where an old summer house and amethyst–encrusted fireplace display that Hampton fondness for enduring statements fashioned from rock and bricks. I keep going back to Brian’s photograph. I went back to it so many times I knew I had to possess it. I went to Historical Columbia and ordered a gorgeous print of this haunting Southern ruin … it will go in my renovated writing studio that has a decided Southern air. Just having that print nearby will elevate my attempts to write about the South more than a few degrees I assure you. The South has beautiful ruins. Sheldon Ruins come to mind. Down in the South Carolina Lowcountry, just off Highway 17 and on a route to Yemassee (Sheldon Church Road), stand old ruins that are as good as most Roman ruins. Massive walls flanked by giant columns with a spacious interior now provide a majestic setting for weddings. Once known as Prince William Parish Church, the venerable old structure has been bedeviled by war and its cohort fire more than once. Continental troops drilled on church grounds, enough justification for General Augustine Prevost’s British troops to torch the church in May 1779. The church was rebuilt from its remaining walls in 1826. It’s believed Sherman’s troops burned it January 14, 1865, though a letter written after the Civil War by one Milton Leverett said, “Sheldon Church not burn’t. Just torn up in the inside, but can be repaired.” Whoever or whatever burned the church failed to totally destroy it. Once again the walls refused to fall. No one bothered to rebuild the church this time, thus the ruins we see today. Down near Savannah, Georgia, we have the tabby ruins of Wormsloe Plantation. Here, you can walk along the walls of an old fort and see remnants of a cellar, well, and hearth. A close inspection of that classic building material, tabby, will reveal oyster shells forever preserved in sediment of man’s making. Walking the Riverbank Zoo’s Botanical Garden’s River Trail overlooking the Saluda River rapids here in Columbia, you can find the ruins of the old Saluda River Factory. This old textile mill arose from granite blocks split on-site. Cloth for the Confederate Arm’s uniforms was made here. Large granite blocks lie askew here and there as if a major earthquake shook them loose. Sherman burned the old factory’s innards, loosening the blocks to the influence of gravity and water. You’ll come across a beautiful keystone arch standing in lush vegetation. Look closely at the nearby boulders and you’ll see drill marks, which split the huge rocks to produce those scattered blocks of granite. Right in the middle of Columbia’s Vista District, a collection of restaurants, drinking stations, shops, and boutiques, stands a Publix supermarket. Go to the corner of Gervais and Huger and you’ll see it, a unique ruin that took on another life. It was here that a mint for the Confederate States of America printed currency destined to be worthless, other than its value for collectors. Now you can buy coffee and more there. The building was burned in 1865 by—you guessed it—Sherman’s forces. It was rebuilt as a cotton bale warehouse. For a while there was talk of razing the old mint/warehouse. During that time, I stopped by one day and retrieved a loose brick for my studio, where it joined a rock from the Chattooga, a brick from Loew’s Grand Theater in Atlanta (Gone With The Wind premiered there in 1939), and two bricks from James Dickey’s house after it was demolished. Right here where I work I have ruins of my own. Ruins evoke emotions. You can’t stand in their presence and not be moved. In one fell swoop you see that, yes, someone had a vision and a dream and the dream was realized but its fate was to end in the heartbreak of utter destruction. Ashes to ashes. One other thought comes to mind. As we live our busy lives, day after day, and as we become consumed with modern times, responsibilities, and duties, ruins like Millwood Plantation, Sheldon Ruins, Wormsloe Plantation, and the Saluda Factory keep on keeping on unmindful of you and me. Outlasting us all. Dust to dust … Long after we’re gone, they’ll carry on providing the curious, other writers, and other photographers reason to marvel at once was but is no more. Others will look at ruins and see their own mortality staring back.